Most of you already are familiar with Cabbage Rolls, but to Eastern European cooks, they are known as Holupki, Holubtsi, or Golabki. 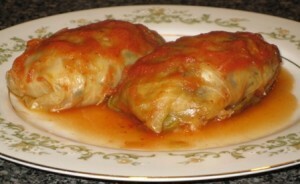 All Cabbage Rolls may look the same, yet be very different, depending on the filling used to prepare them. The most popular filling consists of cooked rice mixed with ground beef, turkey, or meatloaf mix, and spices; however you can also use rice or buckwheat mixed with mushrooms, mashed potatoes, or a vegetarian filling, which I will introduce in this recipe. Cabbage Rolls are not the easiest dish to prepare, since it requires a lot of prep work beforehand, especially the cabbage, but if you love them, it’s well worth the effort. This is how you stuff and fold the cabbage leaves to form a roll. 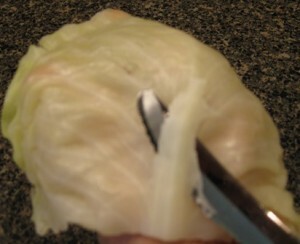 Remove and discard a couple of the outer leaves from the cabbage head, since they are usually damaged. Trim off the top of the core and haul out the core. Add 1 Tbs. of salt, and bring to boil. 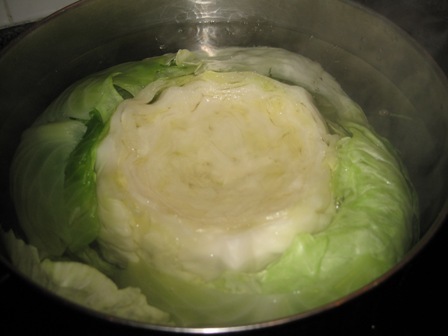 Place the cabbage in the water, with the hauled out end down, and boil it for about 5 minutes. Using the same long fork, start removing parboiled leaves onto a platter. Once all the large and medium size leaves are all parboiled and removed, let them cool off. Trim off the coarse veins from the stem of each leaf. If you want to make small rolls, cut each large leaf in half by cutting out the main vain from top to bottom of the leaf. In saucepan, heat oil over medium heat. Sautee onions, garlic, oregano, thyme, and caraway seeds for 5 minutes, or until softened. Add vegetable stock, bring to boil, reduce heat, cover, and simmer for 20 minutes or until tender. Stir in carrots, zucchini, salt, pepper, and egg. 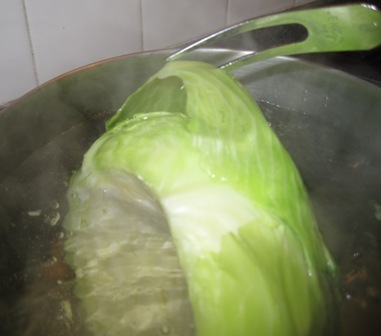 Fill the cabbage leaves to form rolls. Fold up the bottom and sides of the leaf over the filling, then roll up, forming a roll. Line a 9x13 casserole dish with half of the sauerkraut (optional - see tip below). Arrange cabbage rolls on top, side by side, to form a layer. 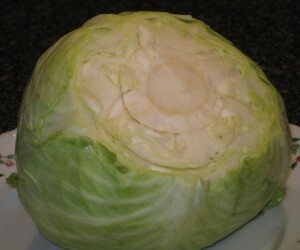 Cover with remaining sauerkraut (optional - see tip below). Whisk tomato paste into tomato juice, and pour over the rolls. Bake in 350 degrees F, for 2 hours, or until tender. You may exclude the sauerkraut, if you are not a big fan of this vegetable, or if you do not wish to experience a more piquant flavor of this dish. In that case, line the bottom of the pan with chopped up left over cooked cabbage leaves. If you do not have any leaves left to cover the top, then the tomato sauce will be sufficient. 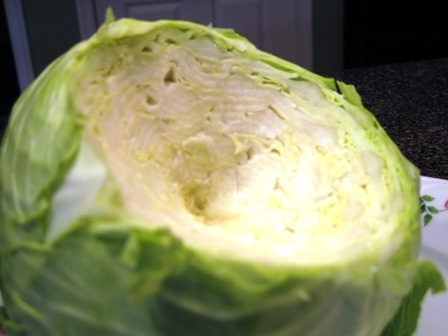 Someone mentioned to me that instead of cooking the cabbage leaves, they freeze the whole head of cored out cabbage, then thaw it when ready to make cabbage rolls. I tried this method, but was not very fond of the flavor of the leaves....I still prefer boiling them the usual way. Well…..live and learn is true for all of us. No matter how much you know about something, there is still more to learn. Sometimes the harder you try to make something so perfect, the results are not always reflecting all the effort you put in….how unfair is that.. I commend you for giving a try to making this dish. Believe me, it gets easier with time, so don’t give up yet! You are very welcome, hopefully you get a chance to make them sometimes. Holubtsi (cabbage rolls) really are delicious, no matter which filling you choose, meat or vegetarian. Sour cream sounds great to top them off with. Great post. Thanks for this great recipe. These days it’s getting easier to live a vegetarian/vegan lifestyle. Yes, I agree, it is much easier now to be a vegetarian, but still ways to go for vegans. Is the rice raw when added — the recipe does’t mention if the rice is cooked or raw. The cook time is more than long enough to cook the raw rice but it seems hard to imagine there would be enough liquid for the rice to cook. I have had dishes somewhat similar that cooked the rice as they baked but there was more moisture involved. 4. Add vegetable stock, bring to boil, reduce heat, cover, and simmer for 20 minutes or until tender. Thank you so much for your comments. The rice is raw, when added to the spices and the vegetable stock. One cup of rice and 2 cups of vegetable stock, cooked covered for 20 minutes, as in this recipe, will cook the rice enough to be suitable for the filling. You got it, and I also answered your original question. Have fun cooking, and even more fun enjoying the food. 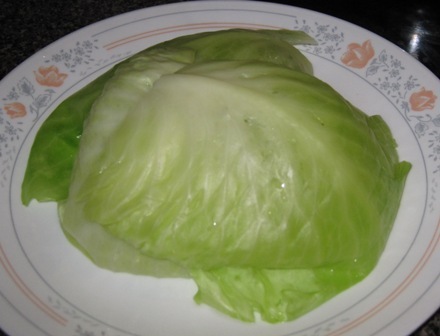 As a child, my mother would make stuffed cabbage (calling it phonetically hablookis) at least every other week–I dreaded those days because they were always stuffed with some type of meat and I hated the smell of them cooking for what seemed to me ALL day (yes, even then I was a closet vegetarian). 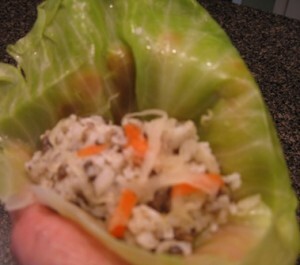 Now, as an adult–and still a vegetarian 50+ some years later–maybe I should give stuffed cabbage a chance. Your pictures and descriptions are beautiful and have given me the opportunity to discard unpleasant memories! Yes, “holoobki”are not everyone’s favorite food item, but some just love it enough to have it often. It is a time consuming project, but worth it, if you like it. My favorite vegetarian holoobki are with cooked rice mixed with sauteed onions and mushrooms, served with mushroom sauce….one of my kids likes these more than the meat ones. If you make these, then you do not use any tomato sauce for baking them,but rather vegetable broth..yum. Thank you for your comments, and good luck with making these.